Sometime ago, I dropped by a middle school to visit a friend and former colleague. While there, I observed her students working in pairs to compete for points as they reviewed material for an upcoming exam. I was captivated by how enthusiastic the students were and how engaged they were in the activity. 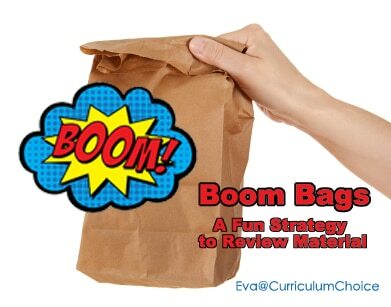 Boom Bags, as she called them, are an excellent strategy for reviewing material prior to an exam. Students love it and it really builds their retention of the material. Best of all, Boom Bags are super easy for teachers to make and don’t require any special equipment or materials. On slips of paper write down key vocabulary, open ended questions, content specific questions, and skill or strategy-based questions on one side of the paper. Include the answer – either below the term/question or on the reverse side of the paper slip. On additional slips of paper (about a 1/3 of the number of questions), write the phrase ‘Boom!’ Put all the slips of paper in a paper lunch bag. That’s it! Teacher prep made easy! To play the game, students work in pairs or small groups and then face off in a competition. This is what the kids love most; the friendly challenge! Student A closes his eyes, reaches into the paper bag that Student B is holding, pulls out a slip of paper, and hands it to Student B. Student B reads aloud the question for Student A to answer. If Student A answers correctly, then he gets to keep the slip of paper and count it as a point; if he gets it wrong, it goes back in the bag. If Student A draws out a slip that says ‘Boom!’ then he is required to put all of the slips he had collected from previous rounds back into the bag and start from 0. This process goes back and forth, alternating between the two students. In a classroom setting, this activity would usually last about 15 minutes at the end of class. The points can be used for extra credit or as part of a whole-class contest. What a lot of fun! Thanks for sharing.